I came across my hoard of SPM-licensing-related snippets the other day. I used to use these back at Sofimage to answer the never-ending stream of licensing questions we used to get. Then open a Windows Explorer window, and drag the log from Windows Explorer to IE. Can you go through the following and let me know what happens? 1. Click Start > All Programs > Softimage Products. 2. 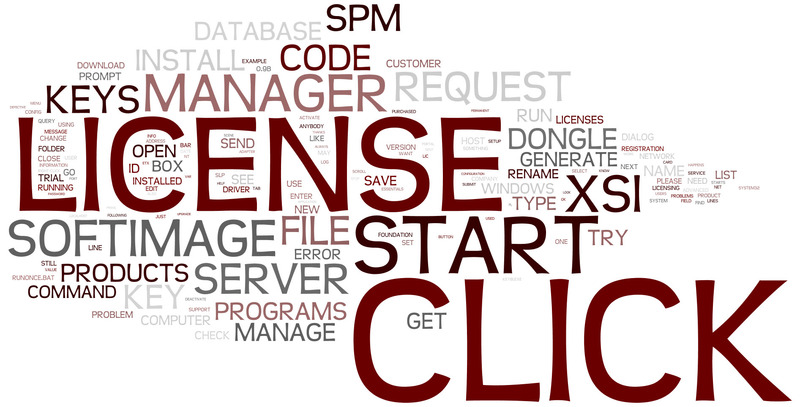 Right-click License Manager and click Properties. 4. Under Privilege Level, select the Run the program as an administrator check box. - Start the License Manager (click Start > All Programs > Softimage Products > License Manager). - Click Edit Config File. - Scroll down until you see the line that starts with "DONGLE_TYPE". - In the License Manager menu bar, click Uninstall License Server Service. - Click Install License Server Service. - Click Manage Key Database. - If the Rename Key Database button is enabled, click it. If you are able to generate a request code, then try again to activate your license. Otherwise, if you get an error when you click Generate Request Code, please send me the SPM server log (c:\spm\spm.log). Thank you for registering for the XSI Essentials v.6.5 30-day trial Download. You will receive a confirmation email shortly. Please follow the instructions in the confirmation email to complete your registration. then refresh your browser. You should then see the download links. I generated a temporary license for you. You will receive the license in a separate e-mail message. The e-mail message will include a .keys attachement. - Save the attached .keys file in C:\spm. - Click Install Keys, click the .keys file, and click Open. - Close the Manage License Keys dialog box. - Send me the request code (you can copy the request code by highlighting it with your mouse and then pressing CTRL+C). - If you get an error, click Rename Key Database and try again. 1. Start the License Manager (click Start > All Programs > Softimage Products > License Manager). 2. In the menu bar, click Server > Deactivate. 3. In the License Deactivation dialog box, enter your softimage.com login name and password, and your registration code. 3. Under Registration Code Activation, enter your softimage.com logon information and your registration code. - In the list of products, click OLDER VERSIONS. You can download XSI 6.02 from the Previous Versions section on softimage.com/downloads. That is not a dongle request. Sorry, I should of anticipated this. - Click Rename Key Database. - Click Generate Request Code. I'm sorry, but we do not have a Trial version of Face Robot. The Face Robot downloads are for customers who have already purchased Face Robot. We need a request codes from the dongle. 1) If you have not done so already, plug in the dongle. When you plug the dongle in, the New Hardware Wizard should open. - Click No, not this time. - Click Install from a list or specific location (Advanced). - Click Don't search. I will choose the driver to install. - Click USB iButton holder for SPM. 3) Send the dongle request codes to License@softimage.com. This entry was posted in Infographic and tagged Licensing, Softimage, SPM by xsisupport. Bookmark the permalink.